The image you see above is roughly 34,000 years old. 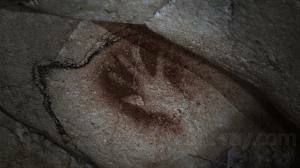 Throughout this documentary they will come upon this hand print a few times, distinctive because of the crooked index finger. This film remains one of the most powerful I’ve ever seen. Something happened during the viewing that connected me to the spirit of these hand prints. Their energy reached across the spans of time and touched me so deeply that day I still feel shivers in remembrance. The commentary throughout this documentary is provided by scientists who are so completely giddy that they were at times like school children. Their wide-eyed wonder at the pristine beauty of the art worked that covers the walls of the Cave Chauvet in France is infectious. But it is the hand prints that got to me. “I was here” is what these images speak. 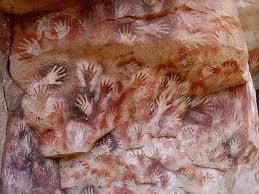 We have an innate human condition to leave our mark on this world, to have somehow mattered, to not be forgotten. Yesterday I had a moment where I felt incredibly small and insignificant. I was out for a walk taking some pictures. A lot of thought moved rapidly through this head of mine. I came home and looked at the clay hand print my daughter made for me when she was in kindergarten. Some 25 years have passed yet it still hangs on the paper plate it was mounted on with a little poem written beneath it. Two holes were punched out and a length of twine was fed through and knotted so that this item could be hung on the wall. It has done so ever since. I smiled when I saw it which triggered my memory of “Cave of Forgotten Dreams”. When I leave this world I hope that somehow my energy will have left a positive foot print or hand print as it may be. In the last year I’ve had many moments when I wondered, however briefly, if I would be alive in a year from now. Cancer has a way of introducing thoughts that I had never before anticipated having…at least not yet. And as much as I entertained the notion that ‘death was not an option’, there were times in the dark of night when the tentacles of fear teased me. Sometimes the weight of all that has transpired seems quite evident in my physical appearance. I look heavy. I feel heavy. And I am. On days such as yesterday though when I am feeling less than, I’ll remember the hand print I saw in a film.